A single drop of rain is enough to send most of us scrambling, but in a new viral video, one brave soul doesn’t just manage to stand in the rain like it were nothing. Instead, he stays almost perfectly still and gets drenched during a full-on hail storm. 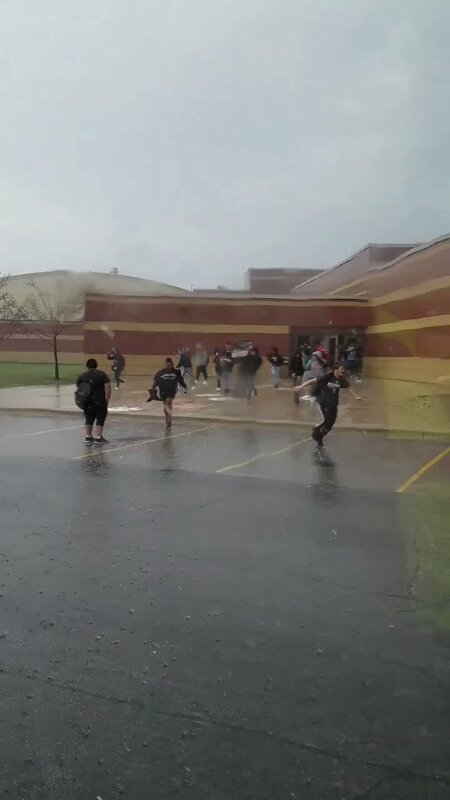 Twitter user Mel caught sight of the high schooler standing around in the storm in just a black t-shirt and pair of shorts while everyone else around him ran for cover. Little did Mel know, she ended up with a gem of a video. In probably one of the greatest ever uses of Tears for Fears’ Mad World, the short clip shows our hero appearing nonchalant about the storm — even pausing near the end to take a look up at the hail for a second or two. Since going viral, many people have tried to speculate what the kid was doing in the storm. Some think he was lonely or had been stood up by a date. But others say he was simply trying out his waterproof headphones. Whatever the reason, he’s now ascended to the heights of viral video greatness for having the courage to do what most of us couldn’t even imagine doing: withstanding the elements for 3/4 of a minute.